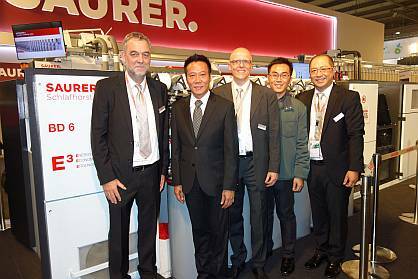 Saurer Schlafhorst's Rotor Spinning product line is highly satisfied with how ITMA 2015 in Milan went. The new Autocoro 9 and the innovations on the BD 6 met with a good response from the industry, which currently attaches a high priority to maximum energy efficiency. The new E³ strategy with triple added value in the spheres of energy, economics and ergonomics proved convincing straight away. With energy savings of up to 25 %, the Autocoro 9 set a new standard for economic efficiency. The new Autocoro 9 proved that the individual spinning position drive is currently the only future-ready rotor spinning technology. The machine's extraordinarily high energy efficiency, demonstrated by the integral Energy Monitoring, is now acknowledged even by third parties. DigiWinding FX, the new benchmark for winding, also met with great interest, as did the wider range of possibilities in automation opened up by SynchroPiecing 24, for example. Even on long machines, this shortens run-up times to less than 15 minutes and makes the processing of raw materials with added recycled materials much more efficient. The BD 6 in a new machine design was the focus of attention on all the show days. Thanks to DigiPiecing it achieves a piecing quality hitherto unachievable in the semi-automatic sector. The BD 6 produces packages in Autocoro format and quality at delivery speeds of up to 230 m/min and is thus in a class of its own. The exhibition teams have returned with full order books. As early as the second day of ITMA, the Autocoro 9 was ordered by an Indian customer. The Indian textile company T. C. Spinners Private Limited from Chandigarh has been familiar with the advantages of the Autocoro 8 for years. With the new Autocoro 9, the family firm can position itself even more successfully in relation to its competitors. The 1000th Autocoro with individual spinning position drive is being supplied to Turkey. This milestone comes only four years after the market introduction of the innovative rotor spinning technology and marks a sensational success. The 1000th machine, a brand new Autocoro 9, will ensure high-performance productivity beyond the bounds of conventional rotor spinning machines at the Turkish textile company Emateks in future. Yarn production is a relatively recent business field for Emateks. The company backs innovation and is thus opting for the Autocoro 9, a guarantee of success. The recycling specialist PT Mitra Saruta Indonesia is also producing on two BD 6 rotor spinning machines. 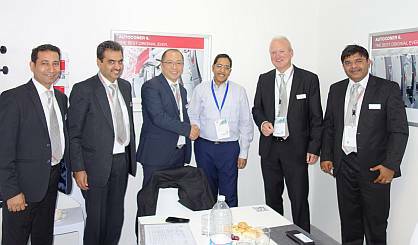 At ITMA, Mitra ordered a further 13 BD 6 rotor spinning machines of the latest generation. The company was won over in extensive testing by the incomparable quality of the yarns and the superb running properties of the packages. Other agreements are set to be concluded, as many visitors signalled a firm interest in purchasing. The German textile machinery manufacturer goes into next year with a highly optimistic outlook, therefore.